As you probably noticed yesterday, I am not much of a shoe person. Books however, are my lifeline. I am the person who can never have enough books and I have raised my family to feel the same way. When we are bored, we go to the library. When we want to go somewhere for the day as a family, we make sure there is a bookstore nearby. I also have a Nook so I can store hundreds of books. My older children have Kindles. See? Books- I love them… and I want more of them. However, this is a decluttering challenge and I know I need to pare down my collection- especially if I want more books in my future! Today we are going to go through our precious books and decide what to keep, what to part with, and how to organize them. 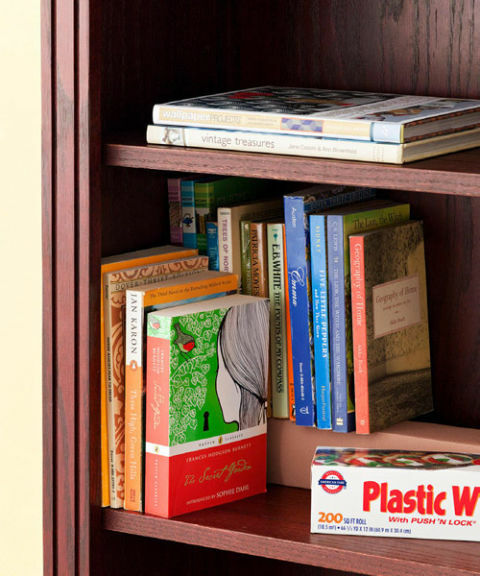 Take your books down from your shelves and start sorting through them. Which books do you need to keep? Is there sentimental value with any? Are there books you read over and over again? Do you need to keep any for educational reasons? Ask yourself these questions when deciding whether to keep a book: Do I love it? Will I read it again? If you can answer yes to those, then keep the book. If not, it may be time to pass it on. Unless they are in poor condition, put your unwanted book in a donation box by your door and take them with you the next time you leave the house. Other people will be blessed to have them! When you know which books you are keeping, begin to organize them. You can arrange them alphabetically, by genre, by color, or chronologically. Put the book back on your shelves and pull them to the edge of each shelf. They look neater that way, and you can arrange them standing up with their spines out, or stack them in neat piles. Phew! I am glad this task is over with! Did you have a hard time getting rid of books, like me? How do you arrange your books? I have such a hard time with this! A couple of years ago, I fell in love with reading! When we downsized, I made it a goal to downsize to one book shelf. It was incredibly hard to do, but I honestly do not remember what I let go of at this point. It is hard, but I feel free from the books that I probably would not have read. Someone is reading them and enjoying them now, so that makes me happy! I have also tried to stop buying so many physical books, unless I need them for reference, college classes, or I find an incredible deal on them compared to ebook form. Good luck! I know it is tough! Thanks Erin! One book shelf…wow. With 8 of it in the house, I could never do that but I have gotten rid of a few boxes. It does feel good knowing that someone else can enjoy them and make memories like we have. I decluttered books recently and I kept the classics and ones that make me happy or were gifts. I tried to arrange them by color for a nice display. I am such a book hoarder! I need to do this challenge! I admit I’m a book hoarder. I hardly ever get rid of any of them! I still have a lot of my textbooks from college. Great tips! I needed this post! I’ve been working on decluttering our house and just did the bookshelf yesterday but I didn’t feel like I got rid of everything I could have.